Brothers Randy and Jason Sklar made “Layers” for TBS’ SuperDeluxe back in 2006 and “Back on Topps” for Michael Eisner’s Web production company Vuguru. Their new series, a bank-robbery comedy called “Held Up,” will premiere September 7 on Crackle.com. The actors talk about the creation of the series and how the Web just might become the new Sundance. 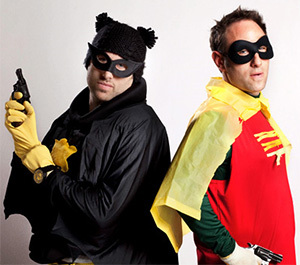 Brothers Randy and Jason Sklar have been innovators in Web series, doing Layers for TBS’ SuperDeluxe back in 2006 and Back on Topps for Michael Eisner’s Web production company Vuguru. Back on Topps won a Streamy this year for best branded entertainment series and set a high bar for how to integrate brands into shows and be funny. Their new series, a bank-robbery comedy called Held Up, will premiere September 7 on Crackle.com, and is directed by Steve Carr (Paul Blart: Mall Cop). The comedians and actors talk with Fast Company about the creation of the series and how the Web just might become the new Sundance. Fast Company: How did Held Up come to be? Jason: The show had an interesting genesis. This was originally a pilot for Comedy Central in 2007 or 2008. It didn’t happen for a variety of reasons, but Sony made the pilot, and they were really big fans of the show. Randy: We didn’t create the pilot, but we were part of the cast. Jason: Right, so we improvised a lot on the set and brought our own spin to these characters. I think Sony gained confidence in us through that, and even though the pilot didn’t go, they really were big fans. Last year they suggested making it a Web series, because they thought it should have a life. I applaud them for that; I think that’s really cool. It’s the reverse of what normally happens. This was developed for TV and came back to the Web. FC: So how did you guys end up running the show? Randy: Sony originally approached Gene Hong, who created the pilot and is a good friend of ours. He was busy with some TV projects of his own, and he very generously suggested us. Jason: We were excited about doing this, especially if we could have a hand in casting it and getting folks that we love involved. We ended up getting to work with exactly who we wanted. FC: How do you promote and market a Web series? Jason: We promote it through any social media we have. We have more than 55,000 followers on Twitter, and we’ll promote it on Chelsea Lately, because we’re proud of it. If we did stand-up on Jimmy Fallon, I’d promote it. I’m so psyched about it. Jason: …each of the people in our show has their following. If I wasn’t part of this project and found out that Kaitlin [Olson] was involved, I’d check it out. Jon Dore has a crazy cult following. FC: You’ve worked in so many different spaces in entertainment. How is the Web changing the industry? Jason: What was the book? Down and Dirty Pictures? It’s about the Weinsteins, Miramax, Sundance, and the film industry in the 80s. The heyday of the beginning of Sundance. The Web, to me, feels a lot like that. It’s hard to make independent films these days because even at Sundance, they’re filled with stars. They’re called indie because they’re not attached to a studio. It’s like the gentrification of indie films. So where do other people go? The Web.